Ramp agents know the importance of designated spaces for all of their job-related materials. That is why Estex has created Estex # W-GATEBAG. This convenient bag will store headsets, safety vests, wands, flashlights, and other job essentials with ease. Customizable with your airline's logo, to your specifications. Looking for something with a little bit more muscle? 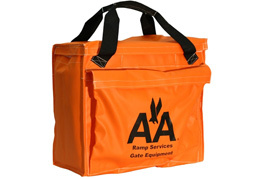 Our upgraded Gate Bag, Estex #W-GATEBAG-UG, boasts hard sides and four industrial strength magnets on the bottom to stand sturdy, even on moving equipment.